The energy-saving qualities of infra-red heating can now be applied in many wet, contaminated or harsh environments with the SS Series of Stainless Steel Tube Heaters from Re-Verber-Ray. The Re-Verber-Ray SS Series of Stainless Steel Tube Heaters offers the latest in technology, and the BEST in durability and performance. 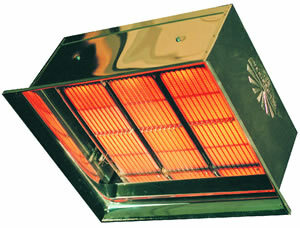 Heater components are totally enclosed in a moisture resistant silicone sealed stainless steel control housing. PVC Coated stainless steel flex connector included with each SS heater. Tube Lengths: 20 ft. to 60 ft. 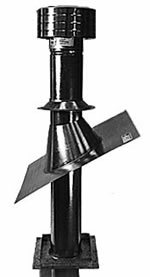 The DR Series is commonly used in areas with high air infiltration, high ceilings and/or spot heating applications. The DR Series is available in a multitude of configurations, ranging from 30 to 160 MBTU/H with 3 different control options. The DR Series of infra-red heaters is ideal in applications where unvented high intensity heat offers design benefits or is preferred. 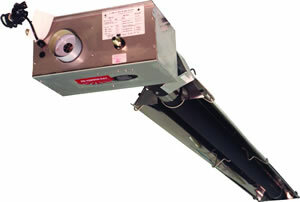 The DR Series is also ideal for unvented spot heating applications. Design A.G.A. Certified, UL Listed, Accepted by F.I.A. and F.M. Select high temperature, Re-Verber-Ray-tor rods increase heater temperature and efficiency.